This story originally appeared on Waging Nonviolence. A group of prisoners’ rights activists didn’t stop a new isolation unit from being approved on January 13, but they did manage to push through some changes to the proposal, as well as long-overdue limitations to solitary confinement at Rikers Island, New York City’s massive island jail complex. In doing so, they went up against the powerful Correctional Officers’ Benevolent Association. The Jails Action Coalition is a grassroots group that has been pushing for an end to all forms of solitary confinement, as well as transparency and accountability in what goes on in New York City jails. Some are people who have spent time in jails and prisons. Others are people who work in these systems, such as lawyers, advocates and social workers. Still, others are family members of incarcerated people. For nearly three years, they’ve worked to shine light on jail practices that often remain out of the public eye, from publicizing and demanding accountability for preventable deaths on Rikers to helping push recent legislation requiring the Department of Correction, or DOC, to publicly report the number of people in solitary, the length of their stay and whether they were injured or assaulted. In April 2013, the group petitioned the New York City Board of Correction, which establishes and monitors minimum standards around conditions in the city’s jails, to amend its minimum standards for the use of solitary confinement, which is also known as “punitive segregation.” The majority of people incarcerated on Rikers cannot afford bail and are awaiting trial. Some are serving sentences of one year or less. The board rejected the petition, but it did commission two reports on the use of solitary in New York City jails. In September 2013, after both reports condemned solitary at Rikers, the Board of Correction voted to make new rules governing solitary confinement in the city’s jail system. But then they didn’t make them. More than a year later, in November 2014, the DOC submitted a proposal to build a $14.8 million Enhanced Supervision Housing unit, or ESHU. According to the DOC, the ESHU would decrease jail violence by segregating up to 250 people who are identified as gang members, committed stabbings or slashings, are found with a scalpel, participate in protests, or engage in “serious and persistent violence.” Those placed in the ESHU would be locked into their cells for 17 hours each day. They would have limited access to the law library. Their mail could be read without notifying either them or the sender. They may not be allowed contact visits with family and loved ones. But, in order to move forward with the new unit, the DOC needed the authorization of the Board of Correction. Activists, including many in the Jails Action Coalition, were horrified. With only one month before the sole public hearing about the unit and two months until the deciding vote, they worked to circulate news about the proposed unit. They urged people to submit written comments to the board opposing the new unit. They urged people to attend and speak at the upcoming hearing. Their outreach was successful. On December 19, 2014, not only had they lined up to attend and signed up to speak at the hearing, but so had many other people who had been incarcerated, worked at, or had loved ones in Rikers. At the same time, however, correctional officers were also mobilized, along with their union, including union president Norman Seabrook, who has gone from being called a “roadblock to reform” to an “enemy of reform” by the New York Times. Uniformed correctional officers took up nearly a quarter of the seating, which prevented people arriving after 9 a.m. from being allowed to enter the auditorium. The hearing lasted for over six-and-a-half hours with 104 people from both sides signed up to testify, many of whom condemned the proposal. After the hearing, members of the Jails Action Coalition met with the three newest members of the board individually to talk with them about the proposed rule and the effects of solitary confinement. Four days before its January 13 hearing, the board published an amended version of the rule it was considering. The rule would authorize the creation of the ESHU, while also placing limitations around punitive segregation, a form of solitary confinement used to punish people who broke jail rules. Currently, only 16- and 17-year-olds are separated from other age groups. People ages 18 and over are housed in the adult units at Rikers. The new rule excludes people ages 18 to 21 from solitary. Those who have serious mental health or physical disabilities are also excluded. Clinicians from the Department of Health and Mental Hygiene decide what constitutes a serious mental health or physical disability warranting exclusion from the ESHU. The rule also states that, if a person is excluded because of their age or health, they cannot be placed in punitive segregation for the same rule violation once their age or health status has changed. In addition, the rule now places a time limit on the amount of time that can be spent in punitive segregation. Under the old system, people could spend months, if not years, in punitive segregation. Now, the department can only place a person in punitive segregation for up to 30 consecutive days. If the segregation sentence exceeds 30 days, the person is given a seven-day break before being sent back to segregation. In addition, the rule sets a limit of 60 days in punitive segregation within a six-month time period unless a person is persistently violent. If a longer time in segregation is sought, the chief of department must approve the extension. The DOC is required to notify both the Board of Correction and the Department of Health and Mental Hygiene and explain the security concerns. Daily mental health rounds must be provided for those in segregation for more than 60 days during a six-month period. Finally, it eliminates the practice of “owed time” in which a person who had been released from Rikers before finishing his time in segregation is immediately placed in solitary if he is ever re-arrested and re-incarcerated there. The hearing on January 13 was not as crowded as the previous one. Less than 50 uniformed corrections officers sat in the back rows while advocates filled the front. The auditorium remained a quarter empty but everyone listened intently. Before the board voted on the proposed rule, Bryanne Hamill, a former family court judge and a commissioner of the Board of Correction, added amendments limiting criteria for ESHU placement and setting a sentencing maximum of 30 days for any one charge. She also added an amendment excluding 18 to 21-year-olds from both the ESHU and punitive segregation beginning on January 1, 2016, so long as the DOC has the resources for alternative programs. “I do not support locking in ESH inmates for 17 hours a day,” Hamill stated, pointing out that, under the rule, those who participate in protests and other disturbances can be sent to the ESHU. She also noted that reforming existing practices of solitary confinement seemed to be “held hostage” by the ESHU proposal. And so, the motion to adopt the rules, as amended by Judge Hamill, was unanimously approved. Although he got the unit he was advocating for, Norman Seabrook seemed infuriated by the accompanying limitations, lambasting the board during the public comments section. 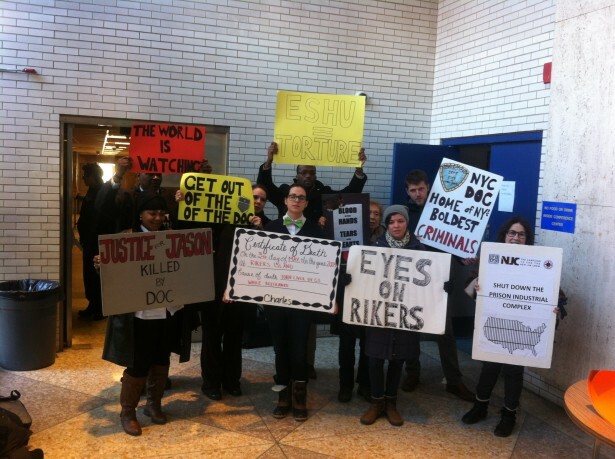 He charged them with listening more to the Jails Action Coalition than to the men and women who work at Rikers Island. “Shame on you for allowing yourselves to be influenced by a small group of people — 90 percent of whom have never been incarcerated and never been a corrections officer.” He charged that the board, by limiting time in segregation, is jeopardizing the safety of both jail staff and those they guard, threatening to sue the board any time an officer is assaulted because of the new limitations. On that note, he walked out of the auditorium, taking with him a small cadre of non-uniformed people from the DOC. Litwok, who had been part of the individual meetings with Board of Correction members, agrees. “I think Jails Action Coalition’s efforts made a dent. It allowed Hamill and Cohen, who were against the unit, to make the amendments [around solitary],” she said. The initial rule, she noted, excluded 16- and 17-year-olds from solitary and eliminated the practice of “owed time,” but did not contain any of the other limits included in the new rule. “Obviously the exclusions for certain age groups is positive,” said Nick Malinowski, a social worker at Brooklyn Defender Services. “But we haven’t changed the paradigm that punishing people is going to change behavior.” The next step, he said, is ensuring that standards are enforced, a task where the board has sometimes faltered. This entry was posted in News and tagged Activism, Activism, Civil Liberties/Civil Rights, Due Process, Legislation, New York, New York City jails, Politics of Punishment, Rikers Island, Solitary Confinement. Bookmark the permalink.